The Kiddie Tax is an alternate, higher rate of calculating tax due that applies to young people. While it was intended to ensure that wealthy parents paid their full share of tax on their investments, it also sometimes applies to graduate students whose income comes primarily from a fellowship or training grant. If you have found this article through search, it’s likely that your (software or human) tax preparer has determined that you owe the Kiddie Tax. This article will help you understand what the Kiddie Tax is, who it applies to, how it is calculated, and how to avoid it in the future. What is the Kiddie Tax? Back in the early 1980s, finding tax shelters (i.e., legal ways to avoid paying tax) was all the rage because tax rates were much higher than they are today. The top marginal tax rate was reduced to 50% in 1981 and finally to 28% in 1988 with the last major tax reform prior to the Tax Cuts and Jobs Act (source). One of the tax shelters was for parents to put income-generating assets in their minor children’s names. The children were (presumably) in much lower tax brackets for investment income than their parents, so overall the family paid less in tax for those assets (source). In 1986, the “Kiddie Tax” was enacted to close this loophole. Under the Kiddie Tax, a child or young adult’s unearned income is taxed at a higher rate than it would be if they were older (with all other factors being the same). How Does the Kiddie Tax Affect PhD Students? The way the Kiddie Tax is written and structured makes sense for the purpose of preventing wealthy parents from sheltering their income using their children. However, it has an off-label effect on PhD students. The Kiddie Tax applies to all children through age 17, some children through age 18, and some students through age 23. It applies to “unearned income,” which includes not only investment income but also income from fellowships, scholarships, and training grants. This means that a graduate student under the age of 23 whose income is from a fellowship may be taxed not at the ordinary income rates that they will be at age 24+ but rather at the rates designed to apply to estates and trusts. The PhD students most in danger of the Kiddie Tax applying to them in a way that will massively increase their tax due are those who received fellowship (non-compensatory) income for an entire calendar year, e.g., January of the first year through December of the second year. For example (approximate numbers), in 2018 a single PhD student age 24 with $30,000 of taxable fellowship/scholarship income and no other income, deductions, or credits would pay $1,970 in tax or an effective tax rate of 6.6%. A student with the same profile who is 23 would pay $5,050 in tax or an effective tax rate of 16.8%. Who Has to Pay the Kiddie Tax? 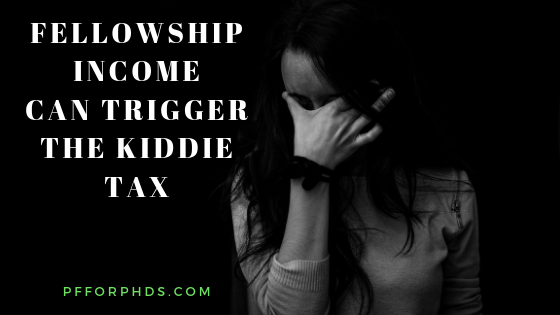 The Kiddie Tax does not apply to every graduate student on fellowship, though it applies to many. The instructions for Form 8615 lay out who has to file the form and (potentially) pay the Kiddie Tax. There are five qualifications for being subject to the Kiddie Tax, all of which must apply. If any one of the following is not true for you, you aren’t subject to the Kiddie tax. 1) You had more than $2,100 of unearned income. For Form 8615, “unearned income” includes all taxable income other than earned income. Unearned income includes taxable interest, ordinary dividends, capital gains (including capital gain distributions), rents, royalties, etc. It also includes taxable social security benefits, pension and annuity income, taxable scholarship and fellowship grants not reported on Form W-2, unemployment compensation, alimony, and income (other than earned income) received as the beneficiary of a trust. 2) You are required to file a tax return. The Form 1040 instructions (p. 9-12) answer the question of who has to file a return. Chart A (p. 10) is for most people under age 65. It states that you must file a return if you are single and your gross income is at least $12,000. Your unearned income was over $1,050. Your earned income was over $12,000. For the purpose of Chart B only, taxable scholarships and fellowships are “earned income” while “unearned income” includes taxable interest, ordinary dividends, and capital gains distributions. If your gross income was less than $11,650 and your unearned income (taxable interest, ordinary dividends, and capital gains distributions) was less than $350, you do not need to file a tax return and are not subject to the Kiddie Tax. Alternatively, you can use the IRS’s Interactive Tax Assistant to determine whether you are required to file a return: Do I Need to File a Tax Return? A full-time student at least age 19 and under age 24 at the end of 2018 and didn’t have earned income that was more than half of your support. A student taking a full-time, on-farm training course given by a school described in (1), or by a state, county, or local government agency. The 5 calendar months don’t have to be consecutive. Full-time student. A full-time student is a student who is enrolled for the number of hours or courses the school considers to be full-time attendance. You do not have to be a student throughout the calendar year to be defined as a student and subject to the Kiddie Tax. You are considered a student if you are a full-time student in (part of) 5 calendar months, which do not have to be consecutive. Defining support and who/what provided it is the trickiest part of determining whether you are subject to the Kiddie Tax. First, you must determine your support, and then calculate whether your earned income amounted to more than half of your support. Support. Your support includes all amounts spent to provide you with food, lodging, clothing, education, medical and dental care, recreation, transportation, and similar necessities. To figure your support, count support provided by you, your parents, and others. However, a scholarship you received isn’t considered support if you’re a full-time student. For details, see Pub. 501, Dependents, Standard Deduction, and Filing Information. Publication 501 includes the Worksheet for Determining Support (p. 15), which you must go through in detail. Your support is the amount of money that is used to pay all your living, education, medical, and travel expenses. The education expenses include the tuition, fees, etc. for your graduate degree. If you do not have earned income totaling at least half of your own support, you may be subject to the Kiddie Tax. Scholarships and fellowships do not count as earned income for this purpose. The support test being calculated this way creates a very high bar for funded graduate students as tuition can easily rival or exceed living expenses. If your parents (including adoptive and step-parents) are deceased, the Kiddie Tax does not apply to you. If you are single, the Kiddie Tax may apply to you. If you are married filing jointly, the Kiddie Tax does not apply to you. If you meet all five of these criteria, you need to fill out Form 8615, as the Kiddie Tax may apply to you. How Is the Kiddie Tax Calculated? Form 8615 calculates your Kiddie Tax. Part I calculates your net unearned income, and Part II calculates your tax. You should carefully fill out each line and read the instructions to find the correct definitions. I have highlighted some points about each line specific to fellowship recipients, but you still need to read the full instructions. Line 1 asks for your “unearned income” as defined above. If you had no earned income (i.e., you were 100% on fellowship for the calendar year and had no other income sources), you can use the value from your Form 1040 Line 7. If you had both earned and unearned income, you need to fill out the Unearned Income Worksheet (p. 2 of the form instructions), which subtracts your earned income from your total income. If you took the standard deduction, enter $2,100. If you itemized your deductions on Schedule A, there is a different formula to use in the instructions. Enter in Line 4 your taxable income from Form 1040 Line 10 (your gross income minus all relevant deductions). Enter in Line 5 the smaller of the values in Line 3 and Line 4. To calculate your tax, you have to use the Line 7 Tax Computation Worksheet on p. 4 of the instructions. This is very long and tedious form. It basically applies the estate and trust income tax rates to your taxable unearned income. The estate and trust income tax rates escalate much, much more quickly than the ordinary income tax rates. You reach the top marginal tax rate of 37% with taxable unearned income over $12,500, whereas you need over $500,000 of ordinary to reach that top rate. Get married and file a joint return. The fact that fellowship income triggers the Kiddie Tax is unconscionable and highly financially damaging to an already vulnerable population (low-income students). This aspect of our tax code desperately needs reform. There are two broad categories of PhD trainee income: compensatory and non-compensatory. Compensatory pay is W-2 pay, whereas non-compensatory is any other regular type of income for a graduate student or postdoc, e.g., Form 1098-T Box 5 or Form 1099-MISC Box 3. For US citizens and residents, both compensatory and non-compensatory pay are supposed to be reported in the ‘wages’ line on your tax return, i.e., Form 1040 Line 1. For non-residents (e.g., some international students and postdocs), other lines on Form 1040-NR and Form 1040-NREZ are used. Read on for the relevant tax code references. Compensatory income comes from work as an employee and will be reported on a Form W-2. The terms used for employees at the postdoc level vary quite a lot, but at the graduate student level the positions are usually called assistantships (research, teaching, graduate, etc.). Your gross yearly compensatory income will appear in Form W-2 Box 1, and the income tax that has been withheld from you pay will appear in Boxes 2 (federal), 17 (state), and 19 (local). Non-compensatory income is given as an award and is not in exchange for work as an employee, and therefore no W-2 is issued. At the graduate student level, non-compensatory pay is usually called scholarships, fellowships, and grants. The titles used for postdocs receiving non-compensatory pay vary, but they are not considered employees. Non-compensatory pay will be officially reported to the student on a Form 1098-T in box 5, on a Form 1099-MISC in box 3 (rarely Box 7), or on a Form 1042-S in Box 2 (for non-residents). It also might be unofficially reported on a courtesy letter or not appear on any documentation at all. Please note that when you calculate the taxable portion of your non-compensatory income for the year, you have two choices for what to do with your qualified education expenses: to take a deduction or a credit. 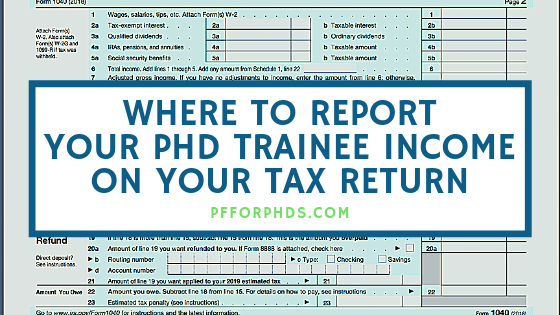 See How to Prepare Your Grad Student Tax Return for more details. How you report any taxable scholarship or fellowship grant income depends on which return you file. Form 1040. If you file Form 1040, include the taxable amount in the total on line 1. If the taxable amount was not reported on Form W-2, also enter “SCH” and the taxable amount on the dotted line next to line 1. Form 1040NR. If you file Form 1040NR, report the taxable amount on line 12. Generally, you must report the amount shown on Form(s) 1042-S, Foreign Person’s U.S. Source Income Subject to Withholding, box 2. See the Instructions for Form 1040NR for more information. Form 1040NR-EZ. If you file Form 1040NR-EZ, report the taxable amount on line 5. Generally, you must report the amount shown on Form(s) 1042-S, box 2. See the Instructions for Form 1040NR-EZ for more information. Form 1098-T is issued to many (though not all) graduate students and reflects some of their higher education income and expenses. Until this year, the 1098-T was rife with problems for funded graduate students, and in many cases caused more confusion than it clarified. The 1098-T underwent a makeover in 2018, which corrected the worst of these problems. However, the shift could cause funded PhD students to owe a larger-than-expected amount of tax in 2018. Form 1098-T is a tax form generated by educational institutions to communicate the education-related expenses and income associated with an individual student. It reflects the transactions in the student’s account (e.g., Bursar’s account) from a given tax year. The form’s primary use is to document the amount of money a student (or the student’s parents) may be able to use toward an education tax benefit. The 1098-T underwent a makeover for tax year 2018, and it has improved significantly. However, some of the issues with the prior version of the form are still causing problems in 2018. This article outlines those problems and their solutions. What Does the 1098-T Communicate? A few of the fields on the 1098-T are most relevant to funded PhD students. This box reflects the amount of money paid on your behalf or by you for tuition and related fees. For example, if your department pays for your tuition, the amount of the tuition will show up in Box 1. This box is no longer in use in 2018, but many (most?) universities used it until 2017. Box 2 also reflects tuition and related fees, but it is a sum of the charges billed in the tax year rather than the amounts paid. A bill could be issued in one tax year and not be paid until the subsequent tax year. This box reflects the scholarships, fellowships, and/or grants received by the student in the tax year. The money that paid your tuition and fees will show up in this box. The fellowship (or other non-compensatory income) that paid your stipend or salary may or may not be included in this box. This box is checked if any bills or payments for a term beginning in January through March of the following tax year were included on the current year’s 1098-T. For example, if your university received payment in December for a term starting in January, this box will be checked. This box is checked if you are a graduate student. The remainder of this article reviews the problems with the 1098-T and how they can be ameliorated. Box 7 concerns the misalignment between the academic year and the calendar year. Ideally, the bills and payments for a given term will all show up on the 1098-T for the same calendar year in which the term falls. Each fall term is like that: you may be billed or make a payment a month or two prior to the start of the term, e,g., in August for a term starting in September, but all the charges and scholarships and payments are done in the same calendar year. However, for spring terms, you may be billed and perhaps make payments at the end of one calendar year for a term beginning in January to March of the next calendar year. In this case, the 1098-T for the earlier tax year is the one that reflects those expenses, and if a tax benefit is in order, it can be taken in the earlier year. In 2017 and prior, this caused a significant though largely unnoticed problem for funded graduate students (or anyone receiving scholarships): A university could post a bill for a spring term in December of the prior year, for example, and not post the scholarship that paid that bill until the start of the term in the later calendar year. That means that the earlier year would have an excess of expenses in Box 2, while the later year would have an excess of income. If not corrected, this could result in a tax deduction or credit in the earlier year and excess taxable income in the later year. The correction that should have been performed throughout these years when a scholarship and the expense the scholarship paid showed up on different years’ 1098-Ts is to match up in the same calendar year the expense billed with the scholarship that paid the expense. Typically, that would mean not using an available tax benefit in an earlier year and preferring to use it in the later year that the income came in. When the expense and the scholarship that pays the expense are used in the same calendar year, the scholarship can be made tax-free using the expense if it is qualified. Specifically, you would report the relevant qualified education expenses in the later year rather than the earlier, meaning that the 1098-T in both years would be inaccurate / need adjustment. Starting in 2018, Box 2 has been eliminated. This means that all universities now have to report payments received for tuition and related fees in Box 1. If the university switched its reporting system between 2017 and 2018, Box 3 is checked. This is a much better system going forward for funded graduate students. It means that when a scholarship is posted to the student account to pay for tuition and related fees, that amount will show up in Box 5 and Box 1 in the same year, since they are the same action. It doesn’t matter if that happens in the same calendar year as the term or an earlier calendar year, because they will always be reported together. However, this change causes two potential problems in 2018 for students at universities that made this switch. 1) If a charge was billed at the end of 2017 for a term stating in the first three months of 2018 and the bill was paid in 2018, the same expense will show up on both the 2017 and 2018 1098-Ts, first in Box 2 and then in Box 1. Therefore, anyone receiving a 1098-T with Box 3 checked must determine whether one or more of the expenses summed in Box 1 was already used to take an education tax benefit in 2017. If that is the case, the expense cannot be used again in 2018. 2) This change in accounting systems also may force the unbalancing issue I described earlier for students finishing grad school. 2018 could be the year that there is excess income with no expenses available to offset it (after correction). If this happens, the student can either choose to pay the extra tax in 2018 or file amended returns going into the start of grad school when this problem originated (up to 3 years) to match up all the prior scholarships and expenses properly. This would still result in extra tax paid now, though it may be less than if the problem remained unamended. The good news is that after catching up in 2018 if necessary, starting in 2019 the 1098-T will be much more straightforward. The tuition and related fees reported on the 1098-T are not quite synonymous with the “qualified education expenses” you use to take an education tax benefit. In fact, there are different definitions of qualified education expenses depending on which benefit you use. Most likely, the amount listed in Box 1 is the amount of qualified education expenses the student has under the most restrictive definition for the Lifetime Learning Credit or the American Opportunity Tax Credit. The definition of qualified education expenses for the purpose of making scholarship and fellowship income tax-free is more expansive. It includes certain required fees and expenses that were excluded from the definition of QEEs for the other education tax benefits, such as student health fees and required textbooks purchased from a retailer other than the university. To find these additional qualified education expenses, check your student account, bank account, and saved receipts. Then, net them against your excess scholarship and fellowship income to make the income tax-free. When Box 5 of the 1098-T exceeds Box 1 for a given student, the university does not have to generate a 1098-T. Some universities, as a courtesy, generate 1098-Ts for all students regardless of the Box 5 vs. Box 1 balance. This inconsistency generates confusion among graduate students and leads to the information in the student account being ignored. 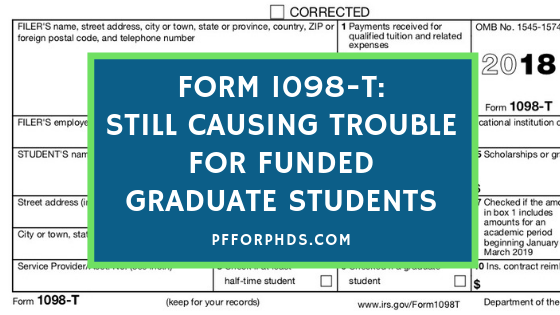 It is clear that the 1098-T was not designed with funded graduate students in mind. Ideally, the 1098-T would be completely redesigned or a new form would be created to assist graduate students in preparing their tax returns. Until that happens, the 1098-T is not an independently useful document as it must be considered alongside the transactions inside and outside of the student account. The makeover to eliminate Box 2 was an improvement; at least starting in 2018, the 1098-T is no longer grossly misleading. There is one vital step grad students need to take when starting to prepare their tax returns. It’s a super simple step, but most often overlooked, and skipping it can lead to an inaccurate return or even overpaying tax. 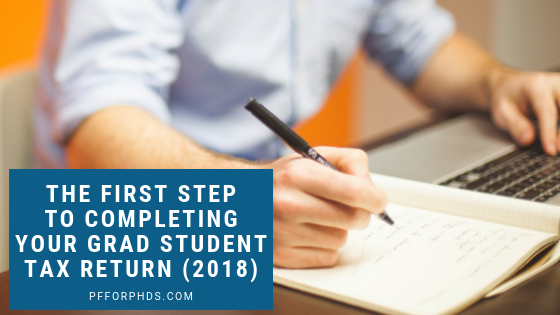 This is the step that you take before you start feeding any numbers to your 1040, your tax software, or your tax preparer, and it is to find and categorize all of your income sources (funded grad students have at least two!). 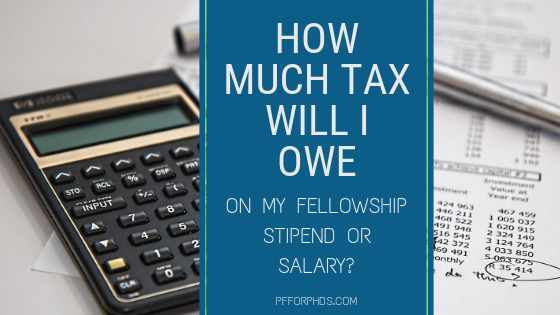 How Much Tax Will I Owe on My Fellowship Stipend or Salary? 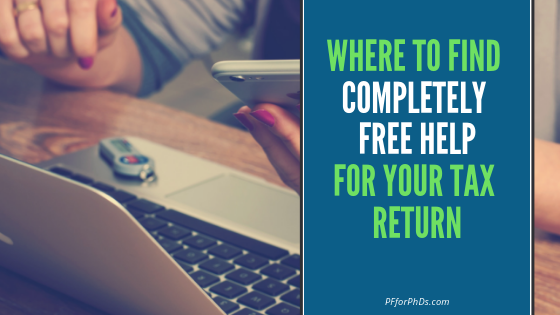 If you have recently started receiving a fellowship for your graduate or postdoc stipend or salary, you are likely aware that income tax is not being withheld for you. While your fellowship income is taxed as ordinary income at the federal and usually state levels, only in rare cases do universities actually offer you automatic tax withholding. Therefore, it falls to you to manually pay your own tax due either quarterly or once per year. But how do you figure out how much tax you will owe on your income? When you start receiving a fellowship and in January of every subsequent year, you should first determine whether you are required to pay quarterly estimated tax both at the federal and state levels. Whether the answer is yes or no, your next step is to calculate how much you should set aside from each paycheck to pay your ultimate tax bill(s) for the year and set up your own system of tax withholding (e.g., an automated transfer to a dedicated savings account following your receipt of each paycheck). Then, you will be prepared to make the necessary payment when the due date arrives. This post details three methods by which you can calculate the approximately amount of federal tax you will have to pay on each month of fellowship stipend or salary income that you receive. Form 1040-ES that you previously filled out is very useful for figuring out how much you should set aside from each paycheck to pay your federal income tax bill. Form 1040 Line 11c tells you the amount of tax you have estimated that you will owe for the year (above what you and/or your spouse will have withheld). Simply divide your value in Line 11c by the number of fellowship paychecks you’ll receive in the calendar year; that is the amount of money you should set aside for federal income tax from each paycheck. With this spreadsheet, you only have to plug one number, which is your gross monthly fellowship income (cell B1, yellow; a dummy amount of $2,500 is already present). If necessary, you may also change the number of children you have who qualify for the child tax credit (cell B3, in orange) and the amount of itemized and other deductions you plan to claim (cell C7 or D7, in orange). The spreadsheet then tells you the amount of federal income tax you should expect to pay from just that monthly income if you are single (cell B17, in red) or if you are married (cell C17, in red). Your monthly income hasn’t changed greatly over the course of the calendar year. The advantage of this spreadsheet over the other methods is that it only asks about one month’s income instead of the entire year’s, so it’s a useful tool if you started your fellowship mid-year, for example after holding another position that automatically withheld income tax for you (as long as the amount of tax you had withheld was close to what you actually owed). In that case, you can get close to the right answer for how much tax you should set aside without having to look at your full year’s income and withholdings for Form 1040-ES. If you’re not sure how to use my spreadsheet or if its assumptions apply to you, just shoot me an email! The IRS also provides a withholding calculator that has been updated for 2018. It asks you to enter your filing status, dependency status, job transitions, which credits you plan to take and their amounts, income, tax withholding, and amount of itemized deductions (if any). This calculator is much more thorough than my simple spreadsheet above. If you have a complicated tax return, this is the more appropriate calculator to use to determine how much money you should set aside for federal income tax payments. If you have a complicate financial life (e.g., a spouse with income, no income or a much higher income earlier in the year, extra credits or deductions), you should use either Form 1040-ES or the IRS calculator to help you determine how much money to set aside for tax from each paycheck because they take into account many of the elements that will be present on your yearly federal tax return. If you are a single-income household and have a simple financial life, my spreadsheet will get you the answer of how much money to self-withhold from each of your fellowship paychecks faster. Whichever way you do the calculation, be sure to follow through on setting up your automated self-tax withholding. It’s the next best solution to having tax automatically withheld from your income by your university!